Every week I will be picking the most interesting piece of prepper gear to spotlight. This week’s spotlight is from dennis.l.b. on Instragram. 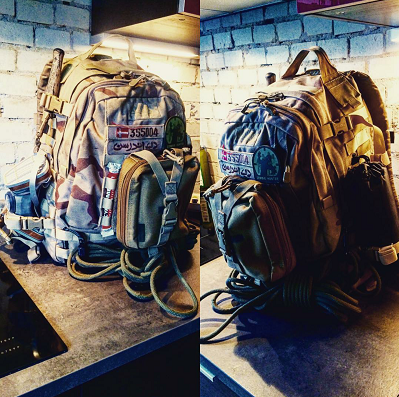 This is his bug out bag which has been highly influenced the video game called The Division. If you play video games then you should check out The Division. The game is in an apocalyptic setting where there has been an virus outbreak that has killed many. Cities have been quarantined off. It’s a fun game that gives you an idea of things that would happen in such a situation. As a prepper it’s great to learn about all the possible SHTF scenarios that could happen. Ultimately though a prepper shouldn’t been spending all of his time playing video games but rather practicing their survival skills in real life. If you would like to share some of your prepper gear on the next spotlight then shoot me some pictures of your gear. You can either send it to aaron@smartpreppergear.com or DM me on Instagram at Smart Prepper. Label each item accompanied with your gear along with any theme that you may be following.